Looking for a simple brownie recipe from scratch? 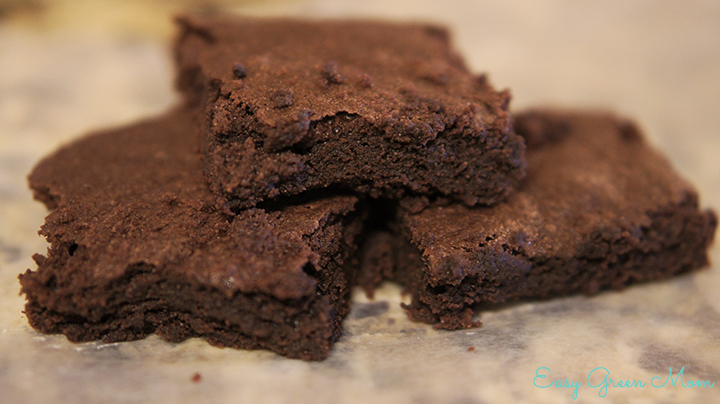 Well, this gluten-free brownies recipe is pretty easy and the result is gooey and oh so yummy! I have made this recipe several time without fail and it’s one of my favorite recipes to make with kids because it is so simple. This batch pictured is from when my 3 year old niece spent the night. She loved them so much she took a few home for her mommy and sister. This recipe uses Gluten Free flour but can be adapted to regular flour and no xanthan gum needed. A delicious and gooey gluten free brownie. Simple to make from scratch. This recipe is for an 8x8 pan. Lightly grease baking pan, and line with parchment. Melt butter and cocoa in a microwave safe bowl. Add sugar, eggs (one at a time), and vanilla to mixture. In another bowl mix your dry ingredients together and then add/ sift into mix. Bake for 20-25, or until a toothpick comes out clean. These pictures were taking pretty much right after they cooled a little, hey I had 3 little kids waiting for them. You’re lucky I was even able to take a picture of this batch! If you are wanting perfectly cut and clean cut brownie bars then chill brownies in the fridge overnight and use a bench knife to cut them. Those look so good! Thanks for linking up with #realfoodrecipes! These look really good and moist! I’ll have to try them out for my little ones. Thank you for sharing. What gluten free all purpose flour do you use? I use Sun Flour Mills. You can order on their website or at vitacost.com. I have tried at least 5 gf flours and this one is my favorite and they are Non-GMO! I love baking brownies and the fact that these are gluten-free makes them a winner. I pinned for future reference. These brownies look great!! thank you for sharing. Love that they are simple and from scratch!! No added yuckyness!!! I’ve never made brownies from scratch before! These look great! Quick question, if my GF all-purpose flour already has xanthan gum in it, do I omit that from the recipe? Hi, I just made these and they tured out wonderful. I used gf oat flour and did not use any xanthem gum, because it messess with my system. I also blinded my sugar, so it was supper fine and easier to incorporate. The top crust was perfect and the taste was amazing. I have tried 6 recipes for gf brownies and this is the first that looks, smells, and taste like real brownies. THANK YOU SOOOOOOOO MUCH, Destiny.